A flow meter is an instrument used to measure linear, nonlinear, mass or volumetric flow rate of a liquid. The AE Air Eliminator is designed to remove air or gasses present in flowing liquid process lines. Applications can vary from use in receiving systems to increase flowmeter accuracy to locations within a process system to improve product quality and performance. The BC104 Batch Controller offers simple easy to understand operation as a batcher that is coupled to a highly flexible platform offering additional input and output capability that can be modified to suit a multitude of applications. Anderson’s HM-series turbine flowmeter is the solution for applications requiring an economical, accurate flowmeter. 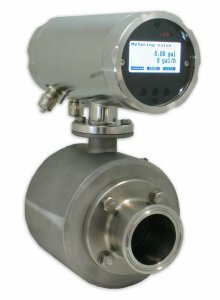 The “HMP” series turbine flowmeter is suited for applications that require an economical and accurate measurement solution. "IZMAG" provides accurate measurement of all electrically conductive liquids. The RZ positive displacement flowmeter is the solution to applications requiring precision flow measurement from a sanitary design. Anderson's RZU series flowmeter is a utility version of the industry accepted Accurate RZ series sanitary flowmeter.